I came into work today and cookie said, "it's your birthday today? 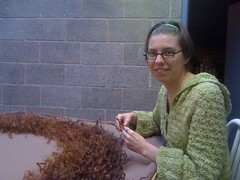 well for your birthday you get to make a troll hairpiece." it actually was a great thing to do on my birthday, if i have to be at work. it was very zen like and it turned out so nice. doesn't it look like real hair? wait till you see it on the troll!